Mali is on high alert after authorities in Bamako confirmed the fifth case of Ebola in the country. Malian President Ibrahim Boubacar Keita visited a treatment center Monday where the humanitarian medical group Doctors Without Borders is receiving patients. It didn’t look good. Three people, all showing symptoms that should have led medical staff to suspect Ebola, all died at the Pasteur Clinic, one of Bamako’s best and busiest hospitals. It wasn’t until health officials in neighboring Guinea alerted Bamako authorities that one of the deceased was an Guinean imam that the Ebola rapid response team was sent to Clinic Pasteur. The Muslim leader had traveled to the Malian capital in late October. When Dr. Samba Sow, who heads the Ebola response in Mali, arrived at the clinic, he found that two of the hospitals’ staff members, a 25-year old nurse and a doctor, already were isolated after showing symptoms. Authorities immediately put the entire clinic, its staff and several patients under quarantine. Over the weekend volunteers and medical staff searched for more than 500 people, thought to have had contact with the Imam or the nurse. The number of contacts is likely to rise in the coming days, according to Sow. “The first day we had less than 100 contacts," he said. "Then there were 180. It rose to 442 up to now when we have identified 552 contacts. I told my team this morning to not rest until they find all of them. By the end of this week I expect we’ll have identified over 1,000 people." The rising number of possible contacts is good news, said the doctor. “The key to contain and fight Ebola is to find as many contacts as possible and then make sure they’re isolated and monitored,” said Sow. 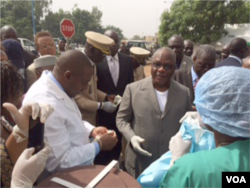 From Bamako, efforts to step up Mali’s Ebola response and contain the country’s second Ebola cluster are underway. On Monday, President Keita visited a treatment center where Doctors Without Borders is receiving and treating suspected and confirmed cases. One patient already is there, the doctor from the Pasteur Clinic. “All measures are being put in place. We’re doing everything we can to step up efforts. I’m confident we will erase Ebola in Mali,” said the president. The male nurse was admitted to the hospital and later died. Doctors say new cases should begin to present themselves two weeks after the male nurse was admitted. One hundred health workers and volunteers are currently looking for people thought to have had contact with the nurse in one Bamako neighborhood. Mali’s Red Cross are busy training more staff. Many Malians are questioning the government’s response. The president is warning all Malians to take Ebola seriously. “We know that Ebola exists. We also know that’s it’s an extremely deadly disease. It’s transmitted mainly through body fluids, such as blood, sweat and vomit. But we also know how to avoid transmission and the most important thing you can do is to wash your hands,” said Keita. “I wash my hands several times a day, even if I’m wearing rubber gloves,” the president continued. For nearly a year, Mali was spared the virus now blamed for killing more than 5,000 people in the region, despite the fact that the country shares a porous border with Guinea where the epidemic started in December last year. Now there are at least five confirmed cases of Ebola and four deaths linked to the hemorrhagic fever. Hundreds of people have been placed under quarantine, including at least 20 members of the U.N. peacekeeping force who were treated at the Bamako hospital where the deceased nurse worked.